Jaan, Swissotel Hotel, Stamford Road. 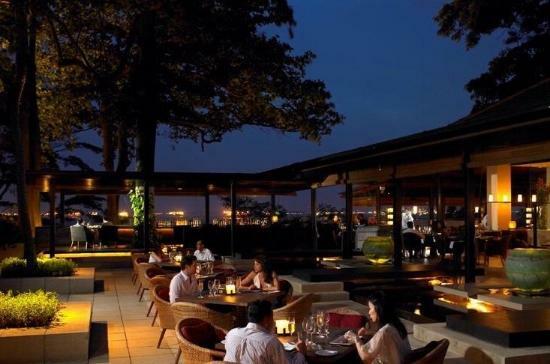 Situate on the 70th floor of the Swissotel hotel on Stamford Road, Jaan is a restaurant that offers great food, and an even better view. 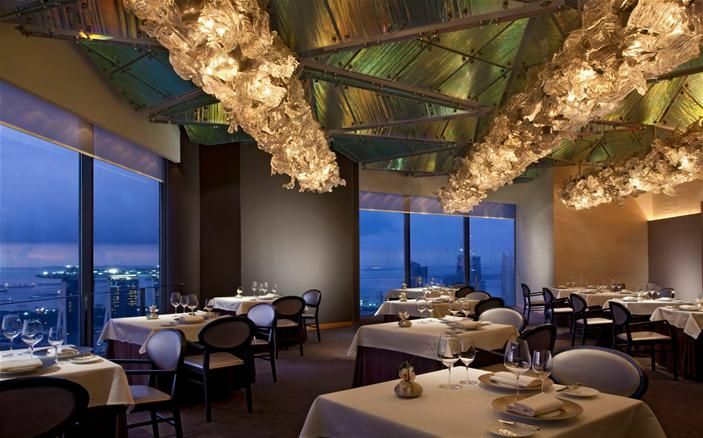 Listed in Asia’s Top 50 Hotels, and for good reason, Jaan specializes in French cuisine with an exclusive menu from the Chef and an excellent collection of wines. No points for guessing that it’s located on a cliff. The Cliff looks over the South China Sea, at Sentosa Island, and has a stunning ambience with cosy interiors and mesmerizing surroundings. The high waves crashing on the rocks beneath you and the entire view is perfect for a romantic dinner with your partner! Enjoy an enthralling meal of European cuisine sitting at the picturesque garden and The Flower Dome at Pollen. 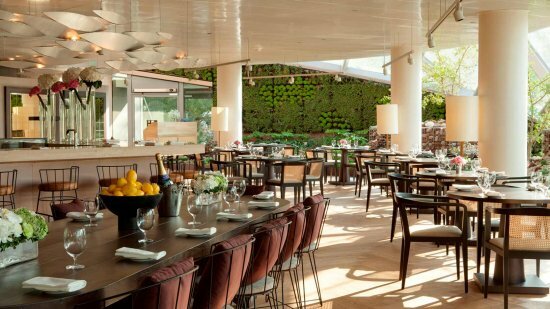 Situated in Gardens By The Bay, Pollen is the perfect restaurants for a perfect first date! Italian cuisine with aromatic herbs and cheese is the best way to impress your love! And The Lighthouse, at the Fullerton Hotel, offers exactly that! With its magnificent view of the Marina Bay waterfront, The Lighthouse is situated where an eighteenth century lighthouse once stood to guide the sailors. The cosy interiors with the glass dome and the rooftop bar promise a good time. Want to go on a slightly different dinner date? Then the Ocean Restaurant by Cat Cora is the place for you! This under-water experience is the best if your better half is an adventure junkie (Or likes the color blue everywhere). 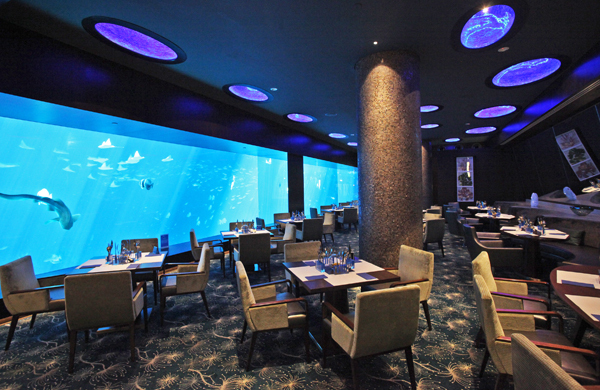 Located inside the S.E.A aquarium, Ocean gives you a glimpse of over 100,000 marine animals. Go here for a unique meal and a distinctive experience. The relation between food and romance isn’t a myth, because as it is said, one cannot sleep well, love well, or think well if one has not dined well! You’ve got to be kidding me-it’s so trannparestly clear now! oCREdx Really appreciate you sharing this post.Really looking forward to read more. Really Great. I precisely wished to thank you so much all over again. I’m not certain the things I would have taken care of without the entire basics discussed by you relating to such a area. It had been a distressing condition in my opinion, nevertheless taking a look at a new specialised form you resolved that forced me to jump for gladness. I am just grateful for the help as well as wish you are aware of a powerful job you are carrying out educating many people all through your web page. I am certain you haven’t got to know all of us. Thanks for your own labor on this web page. Betty delights in doing research and it’s easy to see why. All of us know all of the lively tactic you give both interesting and useful information through the web site and therefore foster contribution from website visitors on this point plus our princess is really learning a lot. Take advantage of the remaining portion of the new year. You’re the one carrying out a great job.